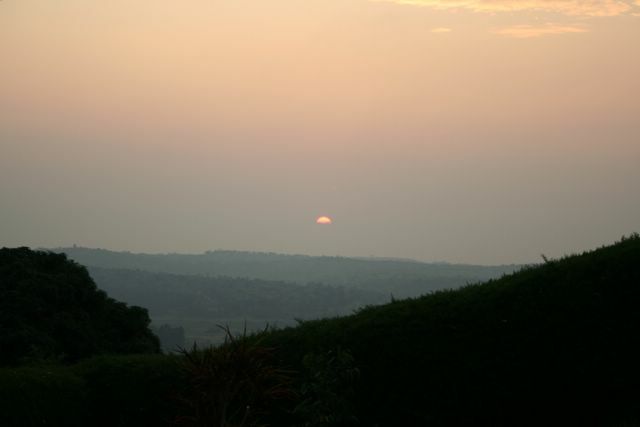 Whoever came up with the slogan 'Rwanda: land of a thousand hills' certainly wasn't exaggerating! With more than 24,000 kilometers of painful pedaling behind us, including the Pyrenees, the Atlas mountains in Morocco and the highlands of Guinea and Cameroon, we somehow thought the climbs would be less excruciating. Fortunately our efforts were rewarded with some spectacular scenery... volcanoes towering in the distance, verdant tea plantations stretching like a ribbon across the hilly highlands, patchworks of neatly laid garden plots, and fragrant pines and eucalyptus providing shelter from the afternoon sun. 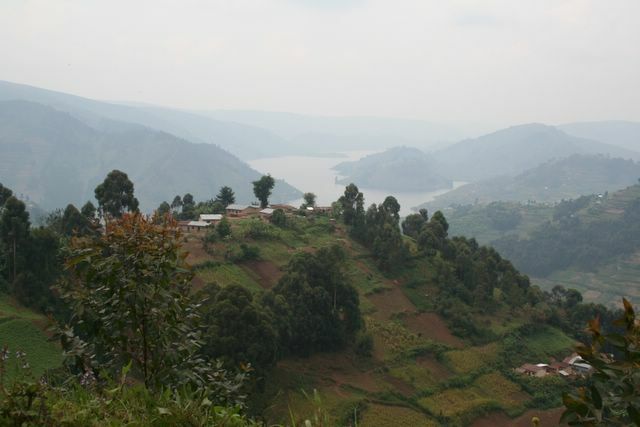 Uganda is known as 'The Pearl of Africa' and with its picturesque crater lakes, majestic mountain forests, terraced hillsides and lush countryside, this nickname isn't just tourist brochure hype. Add to all this natural beauty some incredibly friendly people and the tastiest food we've had since Morocco and you'll see why morale is on the upswing and fantasies of returning to the stationary world are on the wane. This past month has been decidedly un-adventurous--no close calls with rebels, no tropical illnesses to contend with and no hassles or haggling with officials. Mom and Dad will be glad to hear this, and our apologies to those armchair travelers who were counting on us for a bit of excitement to spice up life in the cubicle. Yes, after scrutinizing our stat-counter we see that peak visit times to our site are during working hours--obviously you've all got better things to do on the weekend. We are attempting to cycle to Cape Town and would indeed have arrived there about 10,000 kilometers ago and five months back if we had followed a direct route like some saner cyclists we know. 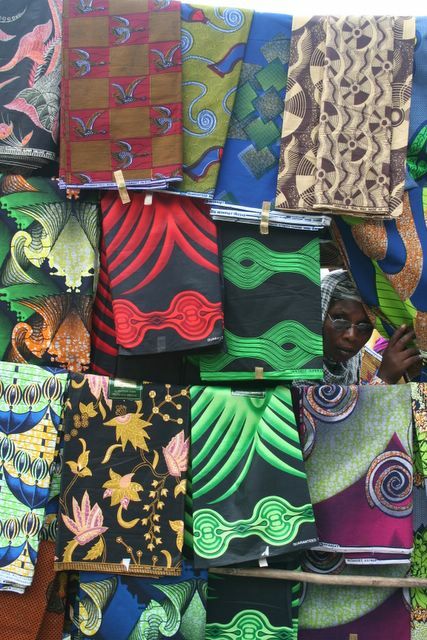 In our quest to discover all parts of Africa (minus war-zones--we've no desire to discover what a bullet entering the body feels like) we sometimes feel as if we're zig-zagging across the continent. Well, one final detour we told ourselves with a sigh as we headed towards Uganda and cycled across the equator for the second time, re-entering the northern hemisphere after having already spent more than two months south of the equator. 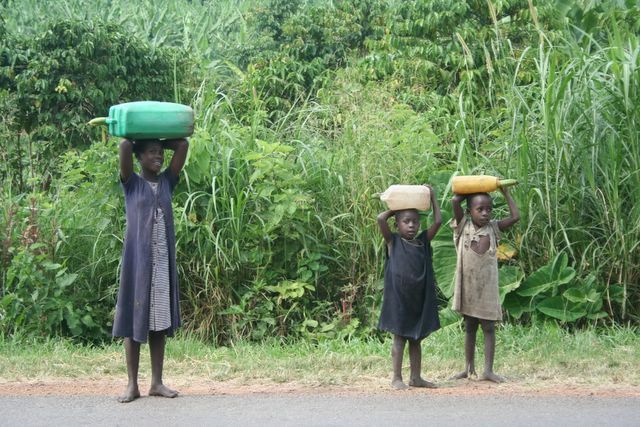 Deterioration is probably the one word that best describes our overall impression of Central Africa. Roads had deteriorated--often not more than muddy, overgrown tracks, the food had deteriorarated--we didn't fancy monkeys and crocodiles on the dinner plate, and worst of all the work ethic seemed to have really gone to pot in this war-scarred region--loitering on the side of the road was a full-time occupation for many. All this has changed--for the better--in East Africa. Rwanda's highways were faultlessly smooth as we swooshed down the winding roads. Thanks to the intense cultivation of the region, markets abound with fresh produce: potatoes, tomatoes, beans, peas, pumpkins, pineapples--even 'exotic' vegetables like cauliflower can be found. 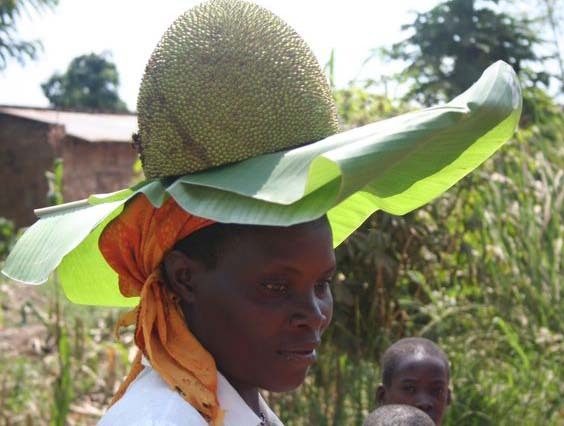 And the people of Rwanda and Uganda are perhaps the most industrious we've seen on the continent. At dawn we can hear the whoosh of the brooms tidying up the simple mud-brick compounds before the real work of hoeing and harvesting begins. The roads are buzzing with activity. 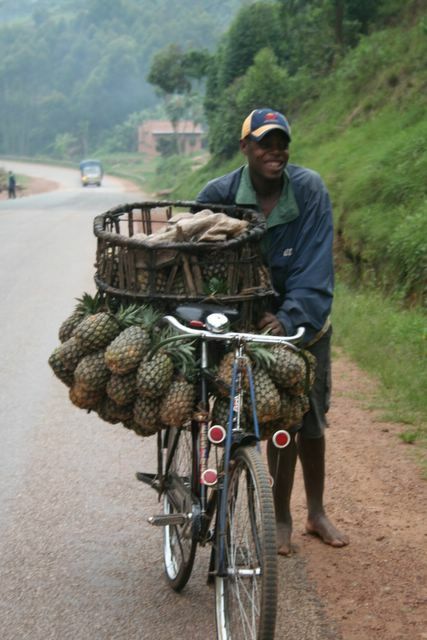 Throngs of children heading off to school in tattered uniforms, muscle-bound men on overloaded bicycles balancing on their back racks everything from farm animals to furniture and passengers to pineapples. Woman with babies on their backs and tools slung over their shoulders trudging off to the family farm. Optimism floods the air. One thing that strikes us as odd in this part of Africa is the number of people running around barefoot. 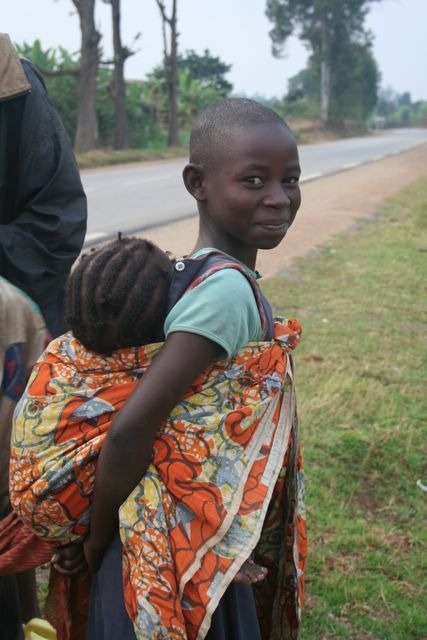 Perhaps memory is failing us (Amaya slipped into her forties in Nigeria)but we recall only those on the bottom of the heap--orphans and beggars--being without shoes, sandals or at least a cheap pair of flip-flops in West and Central Africa. In sharp contrast, we saw the entire student body of a primary school (when we passed they all rushed to greet us) without a single piece of footwear between them in one remote area of Uganda. Even lots of adults, mostly women, can been seen barefoot scampering up slippery slopes schlepping a load of firewood or jerry can filled with water. 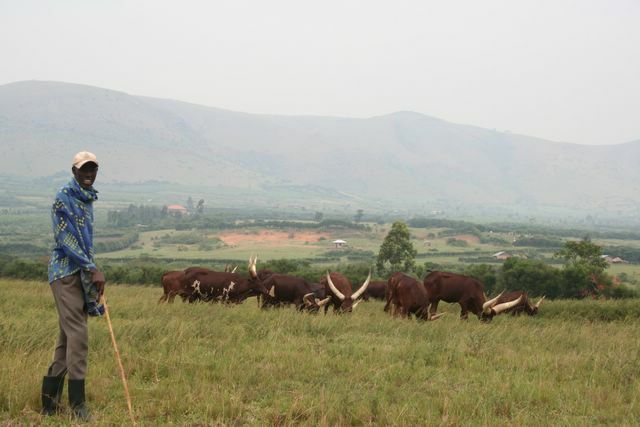 East Africa is famous for its national parks and bountiful wildlife. We were hugely disappointed after having made a detour of several hundred kilometers to reach Murchison Falls National Park in northern Uganda when we were turned back at the gate. No cyclists allowed--we would be just too tempting a treat for some hungry lion on the prowl. This came as a surprise after having been assured at the Office of National Parks in Kampala that we could ride through without a problem. Our only consolation and chance at game spotting was when we passed through Queen Elizabeth National Park early one morning and caught site of warthogs, monkeys and a herd of African buffalo grazing by the roadside. Amaya sped past knowing these animals are regarded as the most dangerous of the 'Big Five' (lion, leopard, black rhino, elephant and Cape buffalo). Eric was less informed and lingered to snap a few shots. Recently our biggest challenge has been trying to find a bit of privacy when nature calls. 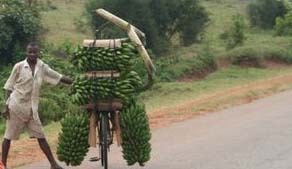 The Rwandans in particular find us so fascinating that we hardly have a moment to ourselves the entire day of cycling. Some will ride along side for 10 or 15 kilometers and then, with a quick wave, turn back and head home. Others like an impromptu race to the next village with the locals always amazed to see a woman pedaling instead of riding side saddle on the back. Lots of encouragement for Amaya and shouts of 'go, sister, go' can be heard from the onlookers. 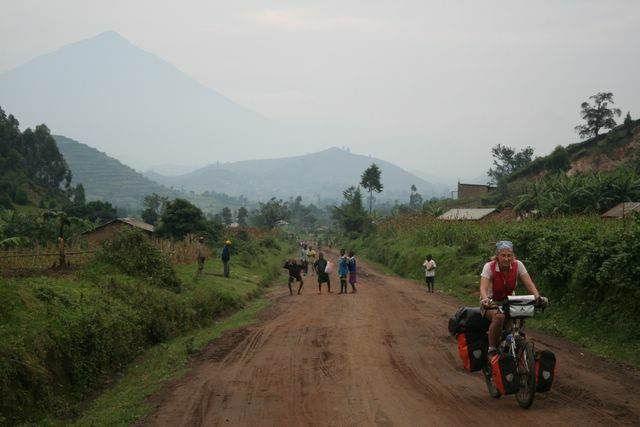 At first we found the children slightly annoying with their constant shrieks of excitement and cries of Mzungu, Mzungu and tendency to run alongside the bikes on the long slogs uphill. Then we discovered their astonishing strength and endurance as we realized they could quite easily be cajoled into pushing us up the long hauls. Most even seemed pleased and proud to expend their energy for the benefit of the Mzungus. Since its rare to have television and most kids don't have any toys, we're the best entertainment around. Next up is Burundi. Another country that's been torn by inter-tribal violence but is currently on the mend. It will be our last Francophone country before we move into the Anglophone countries of the former British Empire. We're looking forward to some flatter roads along lake Tanganiyka and are hoping for another month of adventure-free cycling.